Buying paper rolls in wholesale aren't exactly easy by any means, there are multiple platforms you can use, and it can be a tad confusing if you aren't used to things of that nature. Websites are meant to be not only innovative, but with the creative things they choose to change. Here at Paper Roll Express we're always going to be focused on providing clients with a variety of paper roll options, and we're trying to do it as efficiently as physics will allow us to. Our new website brings a fresh new look to our brand that we've been craving, and it appeals to just about everybody you could think of. When it comes to a paper roll website, there are a few things you look at right away, and one of them is the color scheme. It might not mean a lot to you up front, but subconsciously the color of every single website plays a part in how we react to their offers. We decided to go with a simple look that wouldn't be considered “overboard” by any means, we're just trying to make sure people look at the deals for what they are (as opposed to just visiting our website to see something fancy). Mobile-friendly websites are the wave of the future, if you're a business that doesn't have one set-up you're missing out on an entirely different ball game. We're always on our phone as a society, whether it be to check up on the local news or even just to see what the weather is like. Now can you not only do those things, but you have the ability to purchase paper rolls in bulk as well! Customer service that can't be matched, no matter what! Websites that are meant to sell something you obviously need to be in working order, and that was our goal this time around. We wanted to have a website developed that was going to make a difference in not only our business model, but also how people interacted retail wise as well. We knew we had competitive deals that other companies simply wouldn't be able to keep up with, and a major overhaul of our website is allowing us to finally shine in this industry! It was a large experience trying to put all of this together, and in the end it was definitely worth once we realized just how much was being brought to the table. Mobile-friendly websites are the new-age thing, and there is more than one reason as to why that's true. Of course we were going to make the switch because it's one of the most obvious options out there right now (due to just being accessible and such), but there's also the fact that mobile computers and phones greatly outrank desktops these days. Our deal section have been completely revamped, every single day there's going to be a best-seller item up there on the home page for people to look at. The bestsellers are usually the products that have the most value or offer the most when it comes to certain projects, and that's where you want to look right off the bat if you're interested in quality. You can look at the prices in essentially any type of currency you'd like, so that's nothing you need to worry about if you aren't located in North America. We offer international shipping and will ship to just about any place on the planet, so the deals are always within your grasp. Since the site is revamped we offer a few more products than we initially did before, and the list goes on and on (if we were to list all of them it would take up quite a bit of space). We offer up things like manual imprinter receipts, printer ink ribbons, cleaning cards, bond paper, ATM paper and especially thermal paper. That's literally scratching the surface when it comes to the kinds of paper and paper-related products, we're throwing up at deal prices, and that's why we're one of the leading paper roll wholesalers on the market to date. The more you can offer, the happier your customer is going to be once everything has settled. If somebody can't find a product on our website they're going to go elsewhere, and we just didn't want to lay that upon you guys! That's why we're as vast as we can possibly be with our selection, it's good for the both of us. There's free shipping on every single order that tops the $150 mark, so the more you spend the more you actually save. There's customer support readily available and we even have a return/exchange process set in place, and it only takes three days! If there is ever a problem with your order all you need to do is call up our customer support like (1-800-925-5047), they'll guide you through the entire process and make sure that you're accounted for. Customer service that's not only reliable, but also competent enough to actually help you can be harder than you'd think. We make sure all of our customer service representatives are trained and trained well, thus making our experience one to be matched. That's essentially it when it comes to our brand new mobile-friendly website, now get out there and surf for some paper roll deals; you never know how much money you're going to save when you make use of Paper Roll Express (especially since we're constantly changing for the better). 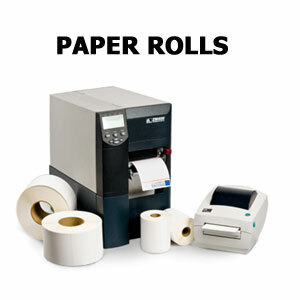 Paper Roll Express was established to help our customers simplify their Point of Sale Supplies at the best prices. No Confusing month to month specials, promo codes, coupons, etc. Our prices are always rock bottom with no confusion or hassle. Find your correct paper size through our simple website, or simply call us Toll Free at 1-800-925-4027 to have one of our local agents assist you.